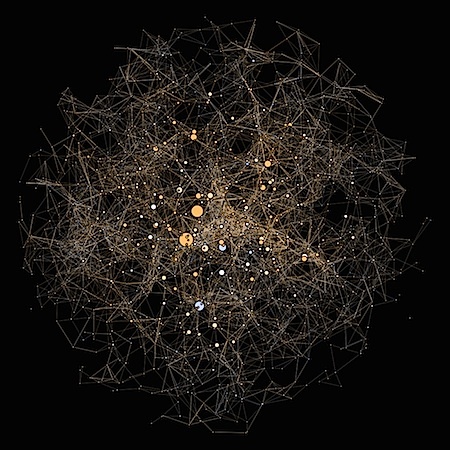 Take a look at this wonderful article on trying to visualize how to travel between the stars. What would a travel network look like? With this spirit of exploration in mind I wondered to myself how, exactly, would one go about navigating the stars. Perhaps due to my being older and wiser (and/or losing my childhood imagination), my fantasies regarding exploring the universe now come attached to limitations and practicalities. Stellar travel is beyond our technical abilities; what with our inability to wield space-time, finite life-spans, and technical inabilities and all. But if we could manage even a relatively modest amount of stellar travel, what would that modest amount have to be to open the network of our stellar neighborhood to us? And what would that 3-dimensional network look like? So, I imagined our Sun surrounded by its immediate neighborhood and saw a network of pathways one could take given a limit on how far you could travel before having to "refuel" at the next star system--say, perhaps, via mining asteroids or by deploying your solar charger. "From star to star," said Ulysses. "Quicker than the thought of it... It will be no more than a switching and a resting point..."
One challenge in accurately visualizing this data is that it has 3 spatial dimensions. Every graph/network visualization I've done before either didn't have spatial dimensions or merely had 2D geo-spatial dimensions. This is a challenge because most graph tools are oriented towards a 2-dimensional layout and visualization. Gephi, a tool I commonly use, does 2-dimensional visualizations. It is aware of 3D coordinates of nodes and can do an okay job of representing it in 2-dimensions. But with no ability to pan, it's hard to get a real feel for what the 3D structure of the network looks like. After some hunting, I found NAViGaTOR which was created and is actively maintained by the Jurisica Lab of the Ontario Cancer Institute. Although it has the ability to do 3D layouts, none of its layouts support coordinate-based layouts from node data. However, after some experimentation, I discovered that if you disable the option which automatically applies a layout on network load, that the default behavior is actually to lay the network out based on node 3D coordinate data. I contacted a maintainer of NAViGaTOR and they confirmed that that is indeed the expected behavior. I maintained the node coloring based on star temperature above. However, I made every node have equal size. Every space-ship within range of her powerful detectors was represented by two brilliant, slowly moving points of light; one upon a great micrometer screen, the other in the "tank"--the immense, three-dimensional, minutely cubed model of the entire Solar System. Be sure to read the entire article Stellar Navigation Using Network Analysis.